Research Center for Biology, Indonesian Institute of Sciences, Bogor, Indonesia. Recently, endophytic fungi have attracted attention due to their ability to produce a variety of bioactive metabolites. In the course of our study on endophytic fungi associated with Albertisia papuana Becc, it has been found the endophytic fungus Xylaria sp. DAP KRI-5 produce cytochalasin D. Isolation of cytochalasin D was conducted by using an open column chromatography method. The chemical structure of cytochalasin D was deduced from 1 dimension, 2 dimension nuclear magnetic resonance, and ultra-performance liquid chromatography quadrupole time of flight mass spectrometry analyses and also compared with the published data. The bioproduction capacity of cytochalasin D by the fungus Xylaria sp. DAP KRI-5 was 0.05763 g/l. Isolation, characterization, bioproduction, cytochalasin D, endophytic fungus. Citation: Fathoni A, Agusta A. Bioproduction of cytochalasin D by endophytic fungus Xylaria sp. DAP KRI-5. J Appl Pharm Sci, 2019; 9(03):105–110. Buckingham J, Baggaley KH, Roberts AD, Szabo LF (eds.). Dictionary of alkaloids. 2nd edition, CRC Press, Taylor & Francis Group, Boca Raton, FL, p 2041, 2010. Cohen E, Ophir I, Shaul YB. Induced differentiation in HT29, a human colon adenocarcinoma cell line. J Cell Sci, 1999; 112:2657–66. Fathoni A, Ilyas M, Praptiwi, Cahyana AH, Agusta, A. Screening and isolation of antibacterial active metabolite from the culture of endophytic Fungi from Albertisia papuana Becc. Berita Biologi, 2013; 12(3):307–14. Luo DQ, Tang HL, Yang XL, Wang F, Liu JK. Fungicidal activity of L696,474 and cytochalasin D from the ascomycete Daldinia concentrica against plant pathogenic fungi. Acta Phytophylacica Sin, 2007; 34(2):113–22. Endophytic fungi are microorganisms that live inside plant tissues without causing negative effects to its host plant (Petrini, 1991). Endophytic fungi can produce diverse bioactive secondary metabolites (Zhang et al., 2006). Various bioactive compounds produced by endophytic fungi have many kinds of biological activity such as anticancer, antibiotic, antifungal, and antidyslipidemic. Some of those bioactive substances are taxol, an anticancer compound produced by the fungus Taxomyces andreanae (Stierle et al., 1993), (+)-1,1′-bislunatin and (+)-2,2′-epicytoskirin A, antibacterial, and anticancer compounds produced by the fungus Diaporthe sp. 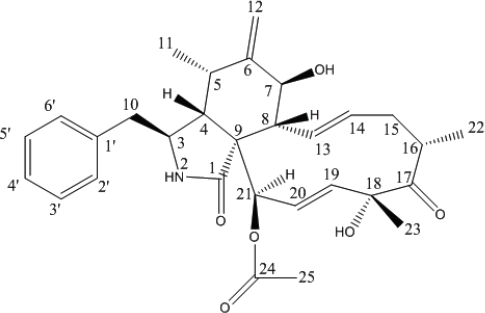 GNBP-10 (Agusta et al., 2006; Praptiwi et al., 2013), micafungin, an antifungal compound from Coleophoma empetri (Frattarelli et al., 2004), rosuvastatin from Penicillium citrinum and P. brevicompactum, which is used for treating dyslipidemias (Scott et al., 2004). In previous work, screening of antibacterial activity of 15 endophytic fungi from leaves and young stems of a medicinal plant, Albertisia papuana Becc. : Menispermaceae, resulted in one selected fungus, Xylaria sp. DAP-KRI-5. This fungus produced some bioactive metabolites with strong antibacterial activity against Staphylococcus aureus. The lead compounds as the bioactive metabolites from this fungus have been characterized as phloroglucinol (Fathoni et al., 2013), and cytochalasin D (unpublished data). Isolation, characterization, and bioproduction of cytochalasin D from Xylaria DAP KRI-5 have not yet been studied. Cytochalasin D was first isolated by Aldridge et al. (1967) and was also known as zigosporin A (Hayakawa et al., 1968). The bioproduction capacity of cytochalasin D has been reported from Xylaria sp. SCSIO 156 in liquid medium (2% mannitol, 2% malt extract, 1% glucose, 1% sodium glutamate, 0.05% KH2PO4, 0.03% MgSO4·7H2O, 0.1% corn meal, 0.3% yeast extract, and 3% sea salt in distilled water and pH 6.5), Xylaria sp. BT05 in a medium of 1,000 g/l of rice in seawater and Xylaria arbuscula in a medium of 1,333 g/l of wheat in distilled water (Amarala et al., 2014; Chen et al., 2011; De Felício et al., 2015). To the best of our knowledge, there are no reports on the bioproduction capacity and antibacterial activity of cytochalasin D that have been produced by Xylaria sp. DAP KRI-5 in a medium of potato dextrose broth. In this study, we evaluated the bioproductive capacity and antibacterial activity of cytochalasin D from Xylaria sp. DAP KRI-5 associated with the A. papuana Becc plant. Endophytic fungus DAP-KRI-5 was isolated from A. papuana Becc. plant collected from the Bogor Botanical Garden, West Java. This fungus was identified as Xylaria sp. in a previous study (Fathoni et al., 2013) and were preserved at −80oC in the culture collection of InaCC, Indonesia. This fungus was cultured in 2.7 l (12 × 200 ml in a 500-ml culture flask and 1 × 300 ml in a 1,000-ml culture flask) of potato dextrose broth (PDB) at 25°C for 14 days in the dark. The fungal culture was harvested and extracted three times with ethyl acetate (EtOAc). The extracts were filtered and concentrated using a rotary evaporator. Isolation of cytochalasin D from an EtOAc extract of Xylaria sp. DAP KRI-5 was conducted by using column chromatography. The EtOAc extract was applied on SephadexTM LH-20 (GE Healthcare) (200 g) and eluted with methanol. The dominant fraction was then fractionated by using a SiO2 gel 60 (Merck) (70-230 mesh ASTM, 100 × weigh of samples), using n-hexane-EtOAc eluent in the ranges of 3:1 to 1:3, followed by CHCl3-MeOH in the ranges of 5:1 to 1:7. The biggest weight fraction F2.3 (113.0 mg) was further applied on a SiO2 gel 60 (Merck) (70-230 mesh ASTM, 100 × weigh of samples eluted with n-hexane-EtOAc in ranges of 6:1 to 0.5:6) resulting a pure compound (1), which was then analyzed for its chemical structure by high-resolution mass spectroscopy (HRMS), 1H-, and 13C-nuclear magnetic resonance (13C-NMR), and antibacterial activity by microdilution methods. Analysis of HRMS of 1 was performed using an ultra-performance liquid chromatography quadrupole time of flight mass spectrometer (UPLC–qTOF-MS/MS) System (Waters). The experimental conditions were column Acquity UPLC BEH (C18 1.7 μm, 2.1 × 50 mm); flow rate of 0.3 ml/minute; Temperature 40oC, mobile phase using a linear gradient of 5% ACN in milliQ water going to 100% ACN for 7 minutes. Both solvents were buffered with 1% formic acid, at an injection volume of 5 μl. The analyte infusion experiments were performed using an in-built syringe pump. A UPLC–qTOF-MS with an electrospray ionization (ESI) interface was used for MS/MS analysis. ESI parameters were the capillary voltage of 3 kV for the positive mode; a source temperature of 110oC; a desolvation temperature of 300oC; a cone gas flow of 16 l/hour and a desolvation gas flow of 550 l/h. 1H- and 13C-NMR spectra were recorded in CDCl3 on a JEOL JNM-Lambda 500 spectrometer at 500 and 125 MHz, respectively. Chemical shift was expressed in δ values relative to an internal standard of trimethyl silyl. The tested bacteria were cultured in Mueller Hinton Broth (Difco) in an incubator at 37oC overnight. The compound was tested against a panel of two Gram-positive bacteria (Staphylococcus aureus-InaCC B4 and Bacillus subtilis-InaCC B1) and two Gram-negative bacteria (Escherichia coli-InaCC B5 and Pseudomonas aeruginosa-InaCC B3). The inoculum was prepared as described previously. The cytochalasin D and the commercial antibiotic were dissolved in 2.5% sterile filtered dimethyl sulfoxide. Bacteria were cultured in the same manner and the compound was serially diluted two-fold across the wells of 96-well plates (NuncTM) with concentrations ranging from 0.25 to 32 μg/ml (final concentration), and plated in triplicate (n = 3). The resultant mid-log phase cultures were diluted to a concentration of 5.105 CFU/ml and included a sterile control (containing broth culture) and a growth control (containing broth culture and bacteria, without antimicrobial substance). MIC is defined as the lowest concentration showing no visible growth (clear) and was determined visually after the addition of 20 μl of Iodonitrotetrazolium chloride (INT, Sigma-Aldrich) water solution (4 mg/ml). The color in the wells changes to purple after the addition of INT if there is a bacterial growth. The commercial antibiotics, vancomycin hydrochloride (Sigma-Aldrich), streptomycin sulfate (Sigma-Aldrich), and chloramphenicol (Sigma) were used as positive controls. The results were expressed in μg/ml. Endophytic fungus, Xylaria sp. DAP-KRI-5, isolated from A. papuana Becc plant that was collected from Bogor Botanical Garden, West Java, was cultured in 2.7 l of PDB at 25°C for 14 days in the dark. The culture of this fungus was harvested and extracted with EtOAc. The extraction process yielded 2.7887 g of EtOAc extract. Extract of Xylaria sp. DAP KRI-5 was fractionated by using column chromatography. First, the extract of EtOAc (600 mg) was fractionated by SephadexTM LH-20 (GE Healthcare) (200 g, eluent metanol) and resulted in F1–F5 (weights were 34.2, 300.4, 4.0, 244.4, and 1.1 mg, respectively). Then, the dominant fraction F2 (208.7 mg) was applied on a SiO2 gel 60 (Merck) (70-230 mesh ASTM, 100 × weigh of samples, eluent n-hexane-EtOAc in the ranges of 3:1 to 1:3, CHCl3-MeOH in the range of 5:1 to 1:7). This resulted in F2.1–F2.9 (respective weights were 12.9, 19.8, 113.5, 11.3, 18.2, 4.9, 17.7, 5.8, and 3.6 mg). 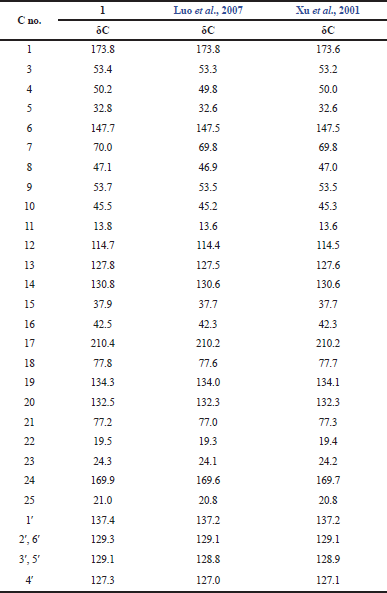 Next, the biggest weight fraction, F2.3 (113.0 mg) was further fractionated by using SiO2 gel 60 (Merck) (70-230 mesh ASTM, 100 × weight of samples in n-hexane-EtOAc in the range of 6:1 to 0.5:6) and resulted in F2.3.1–F2.3.10 (respective weights were 0.7, 0.2, 0.6, 1.6, 0.6, 1.0, 1.9, 3.5, 17.3, and 1.3 mg). One fraction, F2.3.9, was pure compound 1 which was analyzed by HRMS, 1D- and 2D-NMR, and antibacterial activity was tested using microdilution methods. Data of HRMS of pure compound 1 were obtained using UPLC–qTOF-MS/MS: m/z value M + of 507.2615 (calc. 507.2611, Δ +0.4 mmu) with the molecular formula C30H37NO6. The 1H-NMR and distortionless enhancement by polarization transfer (DEPT) data of 1 showed the presence of benzyl with aromatic proton at δH 7.12 (2H, d); 7.31 (2H, t); 7.25 (1H, t) and two diastereotopic methylene protons of H-10 were shifted upfield at δH 2.67 (1H, dd) and 2.82 (1H, dd), one exocyclic olefinic proton of H-12 was shifted downfield at 5.09 (1H, s) and 5.29 (1H, s), two trans-disubtituted of H-13/H-14 and H-19/H-20 [δH 5.14 (1H, dd), 5.69 (1H, dd), 5.34 (1H, ddd), and 6.11 (1H, dd), respectively], and one amido proton was shifted at δH 5.43; 1H, s (Table 1). 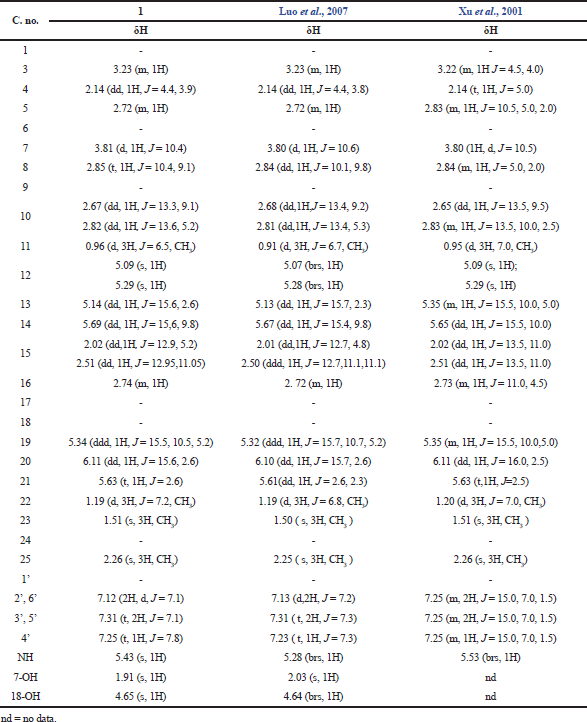 The 13C-NMR data of 1 (Table 2) showed 30 carbon signals including four methyls (δC 13.8, 19.5, 24.3, and 21.0), three carbonyls including two ketones and one ester which were shifted at δC 173.8, 210.4, and 169.9, respectively, and two couples of identical aromatic carbon signals C-2′/C6′ and C-3′/C-5′ which were shifted at δC 129.3 and 129.1, respectively. Using DEPT, it can be inferred that signals at δC 173.8, 147.7, 53.7, 210.4, 77.8, 169.9, and 137.4 are quarternary carbon atoms. The heteronuclear multiple bond correlation (HMBC) correlation also showed a correlation from H-10a (δH 2.67) to C-3 (δC 53.4), C-1’(δC 137.4), C-2’/C-6’(δC 129.3), from H-10b (δH 2.82) to C3 (δC53.4), from H-21 (δH5.63) to C4 (δC50.2), C20 (δC 132.5), and C13 (δC 127.8), and from H-8 (2.85) to C7 (δC 70.0) and C-1(δC 173.8), which supported the 3-benzyl-subtituted isoindolone skeleton and the HMBC correlations from an exocylic proton H-12a/H12b to quarternary carbons C-5 and C7, and from methyl proton H-11 to quarternary carbons C-5, and C-6 which indicated that the structure of compound 1 was analogous to cytochalasins (Fujii et al., 2000; Feng et al., 2002; Lin et al., 2009; Liu et al., 2006; 2008; Xue et al., 2012; Zhang et al., 2008). Other studies have reported that most cytochalasin skeletons share the same stereochemistry (viz., cis-configurations atC-8/C-9 and C-4/C-9 ring junctions), and it has been proposed that the macrocyclic skeleton is stable and relatively rigid despite the large ring size and different functionalities (Buchanan et al., 1996; Feng et al., 2002; Liu et al., 2006; 2008). The 1H- and 13C-NMR data of isolated compound was identic with cytochalasin D as shown in Tables 1 and 2 with a slightly different in measured of chemical shift of proton of NH moiety for isolated [5.43 (s, 1H)] and reported by Luo et al. (2007) (5.28, brs, 1H). However, the chemical shift of NH moiety of cytochalasin D reported by Xu et al. (2001) was appeared in more downfield area (5.53, brs, 1H), with no hydroxy signals (7-OH and 18-OH). The difference of this chemical shift is probably caused by availability of small amount of H2O molecules in the NMR sample that affect to the chemical shift of proton on NH moiety. Based on the above data, it was concluded that the isolated compound from Xylaria sp. DAP-KRI-5 is cytochalasin D and indicated the molecular formula of C30H37NO6 that agree with molecular formula of cytochalasin D published on http://dnp.chemnetbase.com (Buckingham et al., 2010). Antibacterial assays for compound 1 compared with commercial antibiotics (streptomycin, vancomycin, and chloramphenicol) appeared in Table 3. Chemical structure of cytochalasin D is shown in Figure 1. In this study, cytochalasin D, a fungal metabolite was successfully isolated from Xylaria sp. DAP KRI-5. Xylaria sp. DAP KRI-5 is an endophytic fungus that was isolated from the A. papuana Becc plant. This compound was characterized by spectrometry (1D- and 2D-NMR, and HRMS) and was confirmed as cytochalasin D.
Table 1. 13C-NMR data of compound 1 and Cytochalasin D in CDCl3 (125 MHz). Cytochalasin D was first isolated from Metarrhizium manisopliae by Aldridge et al. (1967) and it was also known as zigosporin A because it was produced by the fungus Zygosporium mansonii (Hayakawa et al., 1968), and was also isolated from Engleromyces goetzii (Jikai et al., 2002). However, there are no data citing the bioproductive capacity of cytochalasin D by Z. mansonii, M. manisopliae, or E. goetzii. In other studies, cytochalasin D was also produced by Xylaria sp. SCSIO 156 and Daldinia concentrica (Chen et al., 2011; Luo et al., 2007). The bioproductive capacity of cytochalasin D was reported from Xylaria sp. SCSIO 156, and Xylaria sp. BT05: 0.00126 and 0.00085 g/l of its liquid culture medium, respectively (Chen et al., 2011; De Felício et al., 2015). It has been produced by X. arbuscula with a bioproductive capacity around 0.52733g/l (Amarala et al., 2014). In this present study, Xylaria sp. DAP KRI-5 produced cytochalasin D with a bioproductive capacity of 0.05763 g/l (Table 4). The bioproductive capacity of Xylaria sp. DAP KRI-5 is less than that of X. arbuscula because the X. arbuscula (wheat: 1,333 g/l) culture medium contains more free amino acids and proteins than the Xylaria sp. DAP KRI-5 (PDB: 24g/l) culture medium. The level of free amino acid and proteins in the culture medium are essential factors of the production of cytochalasin D (Amarala et al., 2014). Table 2. 1H-NMR data of compound 1 and cytochalasin D in CDCl3(500 MHz). Table 3. Antibacterial activity of cytochalasin D and some commercial antibiotics. Figure 1. The structure of cytochalasin D.
Table 4. Bioproduction capacity of cytochalasin D isolated from some fungi. In this study, cytochalasin D was tested for antibacterial agent against Gram-positive bacteria (Table 3) with a MIC value of > 32 μg/ml. Cytochalasin D was less active than the commercial antibiotics chloramphenicol, streptomycin, and vancomycin. Meanwhile, the MIC value of cytochalasin D was similar to vancomycin against Gram-negative bacteria (> 32 μg/ml). In other studies, cytochalasin D has been reported to have activity as an antitumor, antineoplastic, antiviral, antianaphylactic, antifungal, and disruptor of actin polymerization agents (Betina et al., 1972; Cohen et al., 1999; Oppenheimer et al., 1995; Shin et al., 1997; Trendowski, 2015; Wang et al., 2003). This compound is effective as a disruptor of microfilament formation so it could act as a chemotherapeutic agent (Trendowski, 2015). The endophytic fungus Xylaria sp. DAP-KRI-5 that is associated with the A. papuana Becc. plant can produce cytochalasin D with a bioproductive capacity of 0.05763 g/l in PDB medium. Cytochalasin D was less potent as an antibacterial agent against Gram-positive and negative bacteria than several commercial antibiotics. The study was supported by the DIPA (Internal Institution Fund) Research Center for Biology, Indonesian Institute of Sciences (LIPI). The authors are very grateful to the Indonesian Ministry of Research and Technology which supported the first author’s graduate scholarship. We thank Dr. Praptiwi who helped to collect A. papuana plant, Muhammad Ilyas who identified Xylaria sp. DAP KRI-5, and Andi Saptaji Kamal for his technical assistance in this research. We also thank Dr. Lina de Montigny who proofread this manuscript.